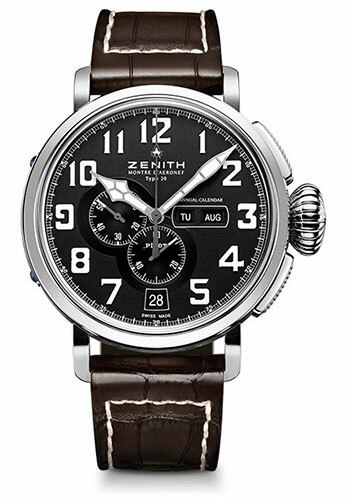 48mm steel case, 15.80mm thick, engraved back with zenith aviation instruments, oscillating weight côtes de genève pattern, steel bezel, domed sapphire glass crystal with anti-reflection treatment on both sides, matte black dial with hour markers arabic numerals in superluminova sln c1 and hands faceted satined black ruthenium, el primero 4054 automatic movement with hours and minutes in the center, small seconds hand at 9 o'clock, day/month indicator at 3 o'clock, date indication at 6 o'clock, 1-counter chronograph: central chronograph hand, 60-minute counter at 6 o'clock, approximately 50 hours of power reserve, brown alligator leather strap with protective rubber lining, steel pin buckle. Water resistant to 10 atm. 48mm titanium case, 15.80mm thick, engraved back with zenith aviation instruments, oscillating weight côtes de genève pattern, crown and horns, push-pieces, titanium bezel set with rose gold bezel, domed sapphire glass crystal with anti-reflection treatment on both sides, matte black dial with hour markers arabic numerals in superluminova sln c1 and hands faceted gold-plated, satined, el primero 4054 automatic movement with hours and minutes in the center, small seconds hand at 9 o'clock, day/month indicator at 3 o'clock, date indication at 6 o'clock, 1-counter chronograph: central chronograph hand, 60-minute counter at 6 o'clock, approximately 50 hours of power reserve, brown alligator leather strap with protective rubber lining, titanium pin buckle. Water resistant to 10 atm.